After World War I, seaborne trade enjoyed a boom that provided an opportunity for a short-lived renaissance of the building of sailing vessels in Åland. The largest Åland peasant shipping company of the inter-war period was Varvs- & Rederi Ab Viking founded in Saltvik in 1917. 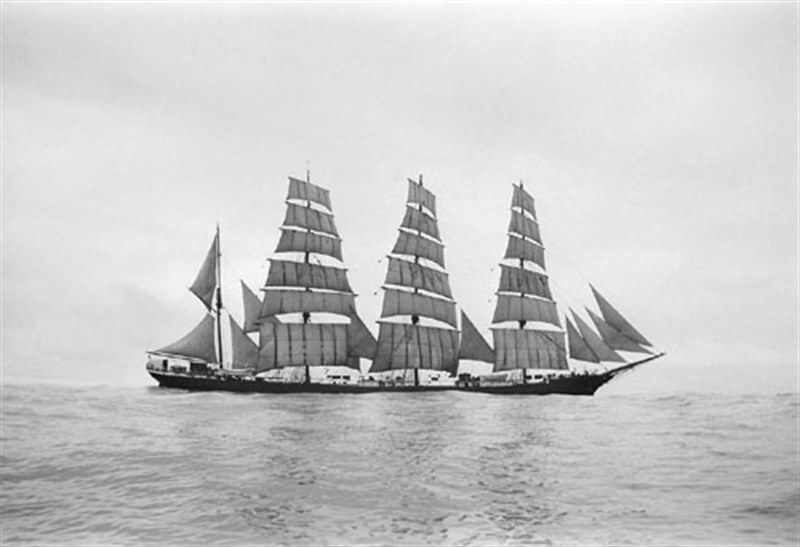 Three-masted schooner VINETA was the only new-building of the company, and she was launched in November 1919. Having sailed the Baltic and North Seas for eight years, she ran aground in a winter storm and wrecked just off Swedish island of Gotland. In the same year 1927, the Viking company was dissolved when the board deemed the era of smaller sailing ships over. The artist’s illustration of VINETA, with rain-soaked sails in a dead calm, being overhauled by a fully loaded steamship, is a reminder of the new times. Not many details of the VINETA I could find, Wikipedia gives for the name Vineta (sometimes Wineta) is the name of a mythical city at the southern coast of the Baltic Sea. The myth evolved around the tradition about the medieval emporium called Jumne, Jomsborg (with which Vineta is sometimes identified), Julin or similar names by the chronicles. Built on the Uddens Varv at Kvarnbo, Saltvik, Aland Islands for Vars & Rederi Ab Viking in Saltvik. 04 November 1919 launched as the VINETA. Tonnage 357 brt, dim. 48m long. Rigged as a topsail schooner. A casualty report in The Times of 17 January 1929 gives. The sailing vessel VINETA came ashore south of Visby, Gotland, Sweden and was wrecked. Her crew were rescued. Internet and info from Mr. Erhard Jung. 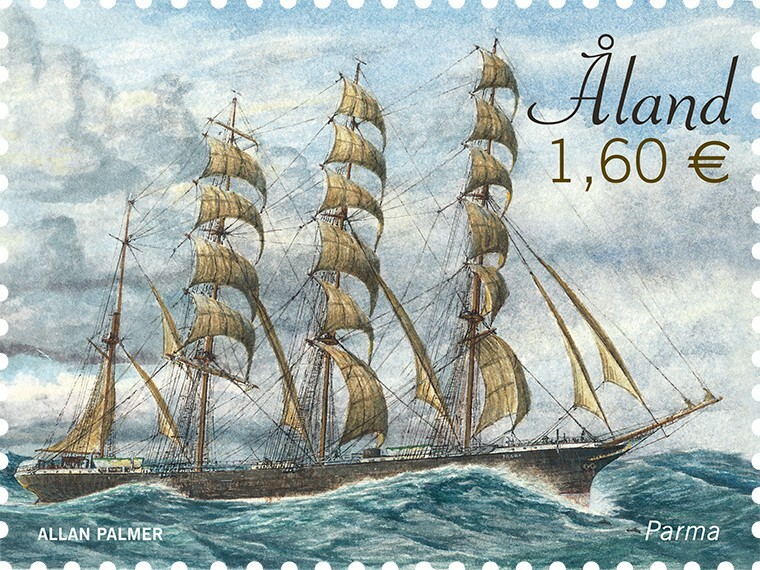 Of the PARMA is given by the Aland Post: Four-masted barque Parma is famous for having made the fastest ever voyage in the 1900s from Australia to England; in 1933, the passage to England took only 83 days with Captain de Cloux at the rudder. In 1931, the captain had formed one of the last co-ownerships of Åland to acquire PARMA from shipowner F. Laeisz of Hamburg. She was built in Glasgow in 1902 as ARROW. 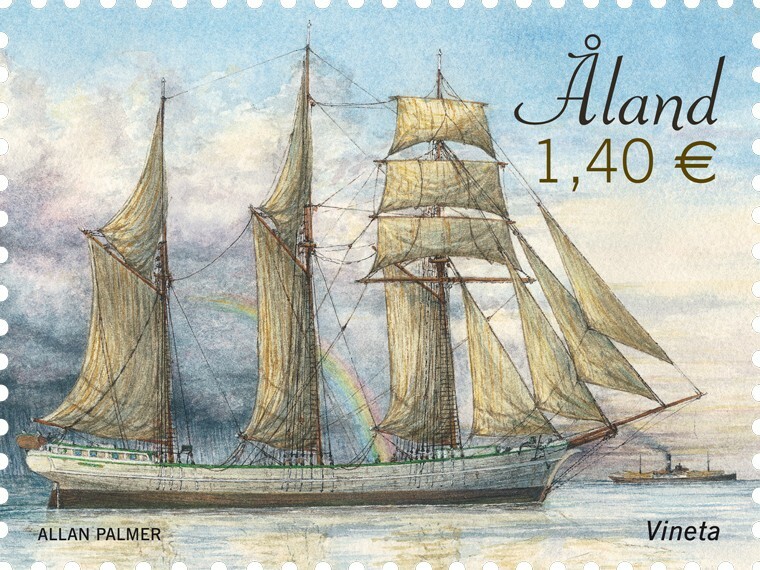 On the stamp, Allan has illustrated Parma on her record passage, sails unfurled and making 12-15 knots heading for the Cape Horn. The sailing era of the ship ended abruptly following an accident in Glasgow in 1936. Aland 2019 1.40/1.60 Euro sg?, scott?